AMAZON RIVER (NNS) – On Feb. 4, 2019, Brazilian Navy Oswaldo Cruz-class hospital ship NAsH Carlos Chagas (U 19) departed Manaus, Brazil with four U.S. Navy physicians embarked to work alongside their Brazilian Navy counterparts and deliver medical care to a series of small villages peppering the coastline of the Amazon River over the course of one month. Within twenty minutes of departure, the demarcation between Manaus’ harbor and the Amazon River became clear. In the deep blue water, patches of dark tan began to emerge – sediment from thick sandbars and the steady erosion of the riverbanks. Floating patches of bright green grass appeared, thriving on the current’s steady delivery of rich minerals. Thick logs floated by, their bark stripped and wood polished to a dark shine by the water. As the sun set behind the clouds, the coastline view became visible only in the periphery, with the brown water asserting its place as the dominant visual element. Since October 2018, Brazilian Navy Lt. Diego Abreu has served as Chagas’ deck and weapons officer. This mission marks his fourth on the Amazon River, and navigating it is an ever-changing challenge. A team of 10 Brazilian Navy sailors, who use both instrumentation and watch standing to ensure safe passage, supports him. “The main challenge is the restricted area we’re navigating in. Sometimes there’s another ship coming, and we don’t have the depth to move to the side. This time, we are moving up the river, against the current. We have to stay really close to the forest, and that’s dangerous sometimes, but we have to maintain speed to get to our mission stops,” he said. A cursory look outside the ship illustrates how restricted this maneuvering is – Brazilian residents who live on the riverbanks can easily be spotted waving to personnel standing outside the skin of the ship. This type of constant navigational discipline, Abreu noted, requires specialized training. “Normally the main navigation training we get is for the open ocean. When we arrive to Manaus is when we get river navigation training,” he explained. Abreu’s team rotates between the pilothouse two decks up from the main level and the forward and aft portions of the ship. “On the bridge, my duty is to work with the operations and engineering departments, but my team is focused entirely on the deck operations,” he said. Navigational charts are used, however the information contained therein can be outdated within hours, which Abreu identified as another challenge. “We make notes and do pass them on to other ships who will be navigating this area. They can use those notes to navigate more safely,” he said. Natural debris such as logs and rocks in the river presents a constant hazard, and at night, a large spotlight operated from the bridge constantly illuminates Chagas’ path forward. With no sonar navigation, an “ecobatimetro” is the only instrument Chagas has to measure depth – and this depth changes rapidly depending on where in the Amazon the ship is. Despite these navigational challenges Chagas was built from the keel up to be a river hospital ship – something unique to the Brazilian Navy’s fleet of five ships designated as such. Chagas’ commanding officer, Capt. Hilcelio Freitas, assumed command just one week prior to departing Manaus. However, his familiarity with the ship started in 2010 when he served as Chagas’ chief engineer for two years. Lt. Cmdr. Robert Lennon, the U.S. team lead, concurred with Freitas’ statement to a degree. 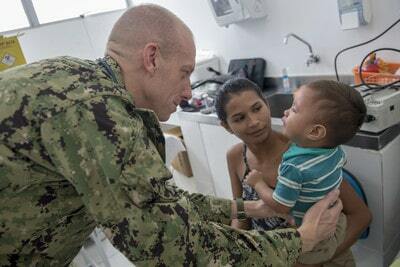 Having served on back-to-back missions in Brazil aboard another hospital ship in 2018, he was quick to praise Chagas’ capabilities. Brazil’s history of bringing humanitarian assistance to communities along the Amazon River dates back 70 years to 1949, noted Brazilian Navy 1st Lt. Gilvan Martins, a general medical officer performing his internship. At that time, the Brazilian Navy was charting the Amazon River, and the visiting sailors saw the people living in the communities along the riverbank were in need. The first Oswaldo Cruz-class hospital ship would not be built for another 35 years, so these ships made use of what was available on board. The Brazilian Riverine Mission is a joint effort between Commander, U.S. Fourth Fleet and the Brazilian Navy’s Ninth Naval District, whose mission is to provide care to local populations, build medical interoperability in support of joint humanitarian and disaster relief missions, and exchange medical knowledge. This is the third mission of its type and is serving as a platform to expand the U.S. Navy’s tropical medicine training opportunities, which will ultimately combine training at the Tropical Medicine Institute in Manaus followed by a joint medical mission within the Amazon River basin. For more information, visit www.public.navy.mil/comusnavso-c4f, on Facebook at www.facebook.com/NAVSOUS4thflt, or on Twitter at www.twitter.com/navsous4thflt.